I am a Strange Loop. You’re a Strange Loop. Wouldn’t Ceptr likely be Strange Loop too? Douglas Hofstadter, in Godel, Escher, Bach and I am a Strange Loop, weaves a pretty compelling tail of how mind and consciousness emerge from self-referential systems configured in a kind of “strange loop.” Our consciousness or possibly all consciousness may emerge from this sort of feedback loop with strange interplay between levels. From a very early point in our MetaCurrency work we identified an underlying pattern of co-emergence and co-creation that seems make for very interesting bootstrapping dynamics – the ability for complexity to emerge from simplicity. In our internal shorthand, we refer to this as “two hands writing” in reference to M.C. 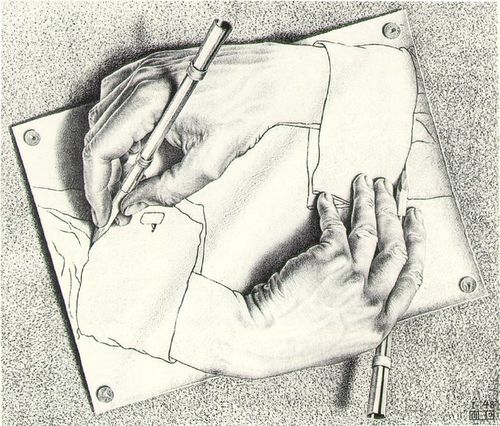 Escher’s vivid illustration of this principle. These are notes in progress about how feedback loops work... not complete... nor necessarily intended to be understandable by others yet... all partially formed. Coupling / Uncoupling – when you connect the “output” of something more directly to the factors affecting its “inputs” it becomes more tightly coupled. You uncouple feedback by inserting another layer of components/feedback/response between the operation of something and the feedback about it.